The new year marks the beginning of a new legislative biennium where HIPHI will be championing policies to address the youth vaping epidemic, curb sugary beverage consumption, expand healthy meals to low-income families, and promote oral health access. We need your support to move these priorities forward. A bill to prohibit the sale and distribution of all flavored tobacco and vaping liquids, including menthol. Eighty-one percent, or 8 in 10 kids, start with a flavored tobacco product. With vaping infiltrating our schools and with 42 percent of all high school students reporting having ever used an “electronic vaping product” in 2017, we have an urgent need to act. Tobacco products are flavored to taste like candy and fruit and many of the packages are designed to look exactly like popular kids candies like Sour Patch Kids, Jolly Ranchers, and Gummy Bears. All our young people deserve protection from a lifetime of addiction. We invite you to join fellow supporters by signing on to our endorsement form to end the sale of candy-flavored tobacco. Help us meet our goal of a hundred organizations before the legislative session starts! A bill to require e-cigarette retailers and wholesalers to obtain a tobacco license or permit in order to sell their products, and establish a tax on vaping products. Tobacco is regulated because of its addictive nature and harm, yet e-cigarettes remain the only tobacco product that is not regulated in the same way as cigarettes and other tobacco products. E-cigarettes have no tobacco tax attached, and they are not required to obtain a tobacco license and permit in order to sell their products. A bill to increase access to healthy foods through “Double Up Food Bucks,” which doubles the purchasing power of Supplemental Nutrition Assistance Program (SNAP) recipients on locally-grown, fresh produce. Double Up Food Bucks is a national nutrition incentive program currently active in more than 23 states. It provides additional nutrition assistance benefits by allowing SNAP recipients to receive a dollar-for-dollar match on locally-grown fresh fruits and vegetables with a financial benefit to local growers. It’s a win-win-win. Nutritious food can be enjoyed by the whole family, local farmers gain new customers and bring in new income, and more food dollars stay in the local economy. A bill to impose a fee on sugar-sweetened beverages at the distributor level. Revenue from the fee will be invested in programs that advance the health of our keiki and families. Sugary drinks are harming our health. Sixty-one percent of Hawaiʻi adults are living with at least one chronic disease such as diabetes, heart disease, or cancer. Teens, the next generation, are consuming 8.6 sugary drinks per week (more than one each day) on average. A fee on sugar-sweetened beverages, with dedicated revenue for the investment in the health of keiki and families, can help reduce sugary drink consumption, prevent chronic disease, and reduce health care costs. A bill to restore preventative dental benefits for the adult Medicaid population. Adult Medicaid enrollees have no coverage for preventive or routine dental care and only emergency dental (extraction or pain management). This lack of access has a negative impact on one’s health, especially for individuals with chronic diseases such as coronary disease and diabetes. In addition, because of the lack of coverage, many low-income adults only seek dental care when they are in crisis. 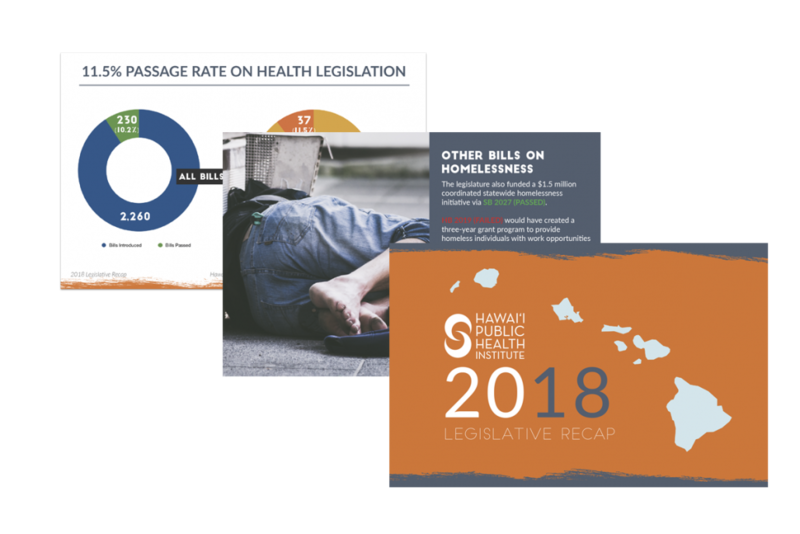 In addition to HIPHI’s priorities, we will also be publishing our 2019 Public Health Legislative Agenda in January that will feature an array of public health priorities beyond tobacco and healthy eating + active living. These will be distributed to all state lawmakers to educate them on public health priorities and elevate the voice and needs of public health. If your organization would like your policy priorities to be considered for the Legislative Agenda, submit them to Trish La Chica at trish@hiphi.org by Sunday, December 30, 2018.